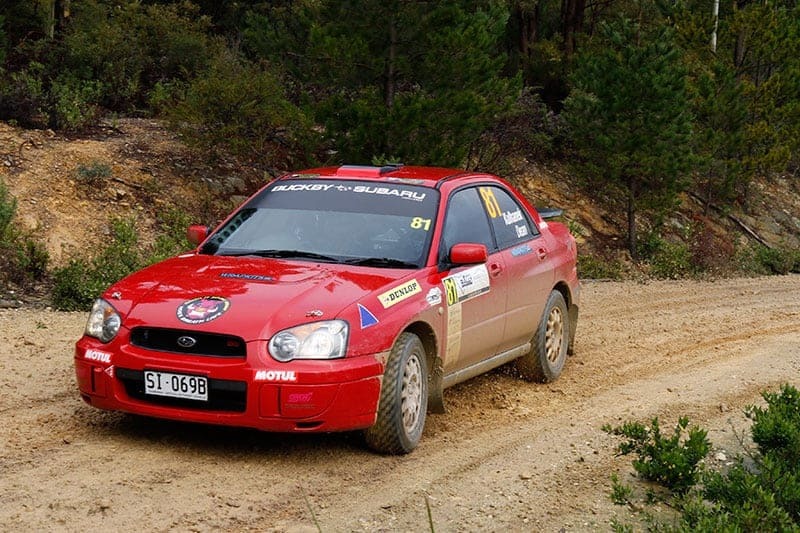 Round 3 of the Buckby Subaru Challenge was run in conjunction with Round 4 of the Australian Rally Championship, Subaru Rally Tasmania. Based out of Launceston, competitors were greeted to a 5000 strong crowd who braved the chilly weather for the ceremonial start and Super Special Stage around the Inveresk Precinct. Eight Subaru Impreza RS’ completed the 900m Super Special Stage, but it was the crew of Nic Grave/Craig Sheahen that took the honours, 1.5 seconds clear of Ben Newman/Adam Kudra, with Tim Kulhanek/Travis Dean a further 0.7 seconds back. Crichton Lewis/Anthony Carr set the spectators cheering, clipping the hay bale at the turnaround point. Saturday morning began with a normal crisp Northern Tasmanian winter day, the first stage being lined either side with a thick frost. Newman was quick out of the blocks, taking 2.7 seconds out of Grave on the opening stage. Grave responded on the following stage smashing Newman by 18.6 seconds to retake the lead. Newman and Grave continued to trade stage times for the rest of the day, however it was Grave who had the better margin ending out the day 59 seconds clear of Newman. The crew of Mike Pritchard/Adam Butler in only their third appearance in the Buckby Subaru Challenge rounded out 3rd place for Heat 1 a further 1 minute 9 seconds back. It was a disastrous debut for the new vehicle of Kulhanek though, spinning on SS6 and crashing into a tree. Likewise Nathan Stokes/Nick Stokes were off road on SS6, but fortunately were able to continue after being recovered. As if Northern Tasmania hadn’t had enough rain in the week preceding, the heavens opened up on Sunday morning and didn’t let up for the whole day. The crew of Elliot Ritchie/Doug Austin unfortunately had to withdraw at the end of Heat 1 due to illness. Again the battle was between Newman, Pritchard and Grave, however it was Newman that faired best, taking 44.3 seconds out of Grave on the opening two stages. His luck would change though on the 25km Lonestar Ridge stage slipping off the road in the muddy conditions and becoming bogged, dropping 45 minutes in the process. Stokes was perhaps the most unlucky, crashing heavily into a tree at the finish line. His event and perhaps car now over. The leader board had completely shifted and it was now Pritchard leading Lewis and Grave with only a gap of 12.8 seconds splitting the three and only a repeat of the mornings three stages left to go. Newman was able to re-join after the lunch break, and didn’t mess around winning SS15, with the last two stage wins shared between Pritchard and Grave. Tarmac specialist Mike Pritchard proved his exceptional talent has converted over to the gravel, consistently in the top 3 all weekend taking out Heat 2 honours 10.3 seconds clear of Grave, his second heat win since joining the series after taking out Heat 2 at last month’s Hellyer Rally. 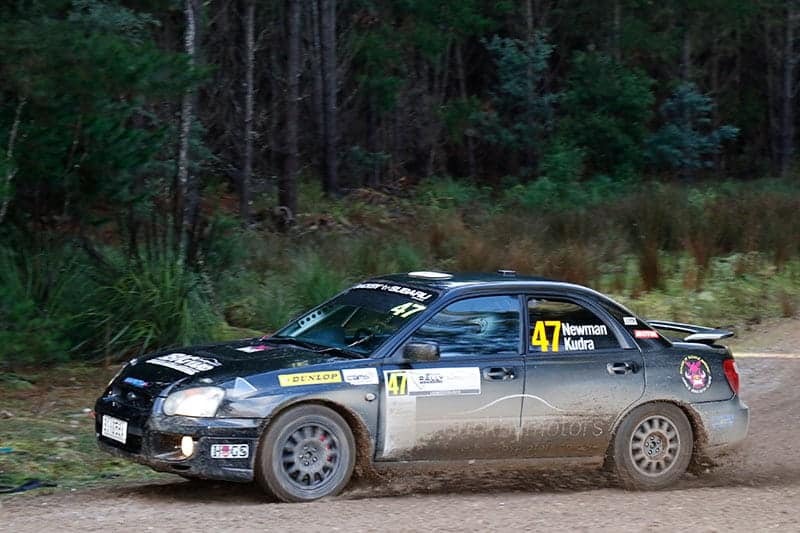 Overall results saw Nic Grave/Craig Sheahen not only take out the Buckby Subaru Challenge, but stand 3rd place on the podium for the overall Tasmanian Rally Championship, an incredible result and a testament to the strength and ability of the Subaru product. Round 4 of the Buckby Subaru Challenge moves back to the North West for a Sprint Rally on the 8th September, based out of the Rocky Cape Tavern. The Buckby Subaru Challenge is a one make series based on the 2001-2005 Subaru Impreza RS 2.5i. It is a perfect entry level vehicle for those considering the world of Gravel Rallying. The rules enable safe, cost-effective racing on an even platform. A ready to rally car can be purchased for under $20,000 with parts easily accessible and affordable.